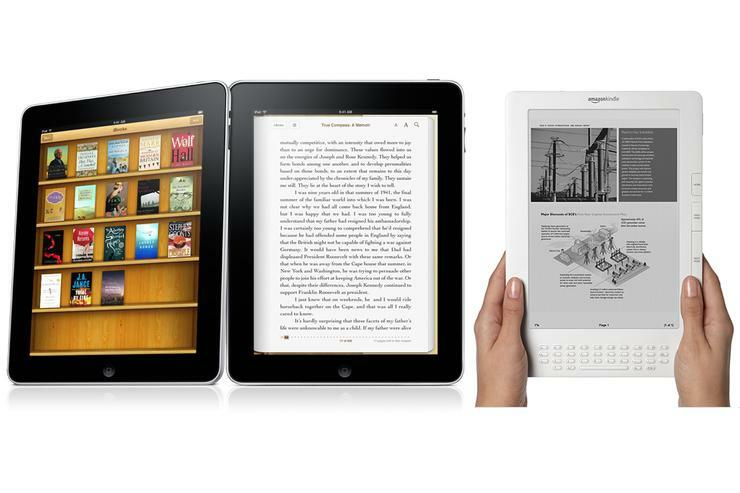 The iPad and Kindle are two very different devices, but ultimately the iPad wins through its sheer versatility. Results of a survey conducted by ChangeWave indicate that the Apple iPad is killing the Amazon Kindle in the e-reader market. However, the two devices are actually not direct competitors, and the ChangeWave survey results reflect a different reality than what it might seem at face value. Comparing a Kindle and an iPad is like comparing a spoon to a Swiss Army knife. Yes, both enable someone to eat a bowl of soup, but the spoon is more or less limited to that role, while the Swiss Army knife might also include a corkscrew, can opener, wire strippers, scissors, tweezers, magnifying glass, and screwdriver. Trying to determine which one is "better" is entirely subjective, and ultimately futile. If you had a Venn diagram depicting various functions possible with a Kindle vs. an iPad, it would illustrate that the Kindle overlaps the iPad when it comes to reading digital content -- but that the iPad sports a myriad of additional capabilities the Kindle can't compete with. My PCWorld peer Brennon Slattery feels very strongly that it is insane to compare the two against each other. Slattery states, "The only comparison between the iPad and the Kindle I have drawn is that they are both consumer electronic products. That's it. Though it now features a few games, the Kindle is primarily for reading. The iPad is mobile entertainment that just so happens to have an e-book platform." But that, my friends, is the crux of the matter. Users want the versatility and functionality offered by a gadget like the iPad, and they don't want to purchase multiple devices to get it. If all you want is an e-reader, the Kindle or Nook are more affordable options, and arguably better in many ways for the task of reading digital content. But, the fact that they are limited to reading digital content is a handicap that works in the iPad's favor. I agree with the underlying sentiment expressed by Slattery. In fact, I wrote a similar tirade back in September when Amazon began a marketing campaign specifically targeting the ways it was superior to the iPad. However, I have come to realize -- as Amazon apparently did as well -- that the iPad is, in fact, a rival to the Kindle. I actually own both a Kindle and an iPad, and I have a large and growing library of Kindle e-books -- but I read them almost exclusively on the iPad. I like being able to carry my entire library with me, and read on the go when the mood strikes, but I also like being able to check my e-mail, or watch a Netflix movie, or check movie times on Fandango, or waste some time playing Angry Birds. So, I carry the iPad because it has the versatility to do all of the above. The one major factor separating the two -- aside from versatility -- is price. While many users might prefer the expanded capabilities of an iPad vs. a Kindle, you can't ignore the fact that a Wi-Fi iPad starts at $500 while the Wi-Fi Kindle is only $139. But, you also can't ignore that buying both would cost $640 and require carrying both devices. For now, the e-reader and tablet markets are both growing, and Amazon and Apple are both reaping the benefits. The Kindle will probably break records this holiday season, and continue to do well for those only in the market for an affordable e-reader. But, anyone considering a Kindle vs. an iPad will most likely choose the iPad so they can have the whole Swiss Army knife instead of just a spoon.